Patience is a fruit of the Spirit, and the lack of it exhibits a resistance to the Spirit in the particular situation you’re facing. 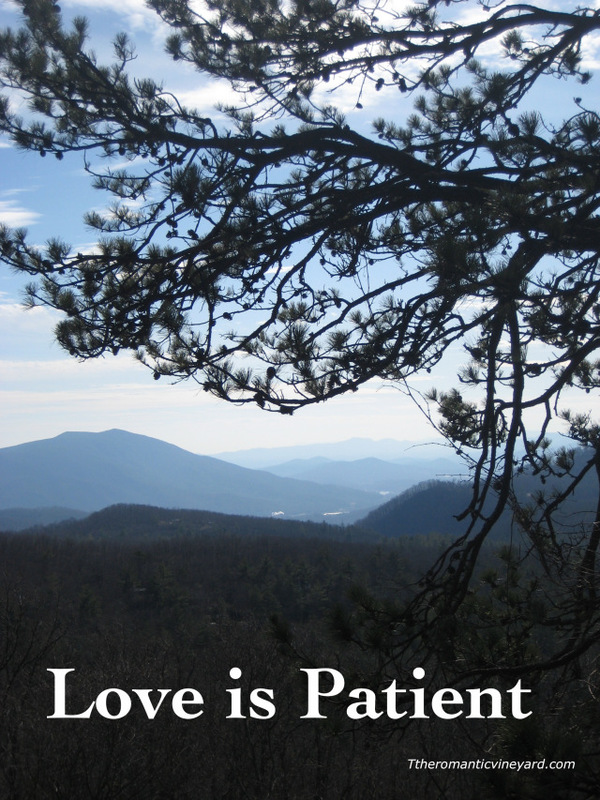 We did an entire series on what Love Is, and it included a post about Patience or Long-suffering. But today I want to share with you the practical side of patience. It’s where we live each day and the choices we make. The past two months have been volatile for our marriage, and we have a strong relationship. Tom likens it to walking on eggshells, and it’s because of me. Thanksgiving and Christmas are very special times for our family, as I’m sure it is for your’s too. We have lots of special traditions we look forward to sharing together. But this year everything was different. We spent our first Thanksgiving away from our children, which was very strange and quite emotional. But God helped me through it as I had no doubt we were right where God wanted us to be. And it was good. Add to that my Mom’s illness–Christmas was spent mourning her passing, along with the nasty virus going around hitting both Tom and me. We were emotionally and physically spent. To make matters worse, our communication started missing more than hitting. I would say one thing and Tom would interpret it in a way I didn’t mean. Or he would say something to me I wouldn’t like and just get angry with him. Anger for me isn’t a blow-up in your face kind of anger, it’s more of a steaming hot simmer. We didn’t let much time go by before talking things through, but with my emotional state, even the making-up part wasn’t satisfying. God is showing me how much I trust in my own ability to control myself in situations. I’ve learned through the past two months who I would be apart from His work in my life. It wasn’t pretty. Yet, Tom continued to tell me every day that he loved me. And it wasn’t in a casual way as we walked by. He would stop me, hold my head, look me in the face and say it. I must admit I was tempted to roll my eyes and say, “yeah, right!” But I knew he meant it. How? Because of his patience towards the ugliness of me. He sees God at work even in those places and loves me patiently–like Christ. I would like to tell you I do the same, but I often react to the here and now without regard for the “not yet” of what God is doing. This proves itself when we find ourselves acting in a way we know we wouldn’t normally have acted–When we hold our tongue and choose to think the best of our spouse instead of jumping to conclusions–When we choose to love and embrace, rather than point and lecture. Life is hard. But the good news is Christ has given us everything we need to grow and change. All we have to do is humbly accept His will, His way for us. Having a spouse who patiently walks beside the tumultuous river as well as the quiet stream with us makes the journey more bearable and most of all, more God-glorifying. In what ways does your spouse exhibit patience towards you? What can you do to make it easier for them? This entry was posted in Christian Marriage, communication, Conflict, Difficulty, Growing Strong Marriages, The Gospel & Marriage and tagged Anger, Christ, Christmas, Fruit of the Holy Spirit, God, Love is, Patience, thanksgiving. Bookmark the permalink. Thank you so much for sharing this! Truly an encouragement. I am sorry to hear about your mother’s passing. I pray that God will fill that space with His sweet Presence. The statement that you made that I am taking away and thinking on today…. that God was showing you how much you trust in your control in situations, and who you would be apart from His work in your life. Both are things I need to be reminded of!! This made me cry. I know how much you and Tom love each other and am so proud for the way he reacted to you in your sorrow. Your post really hit home for me today. I have been struggling with infertility for 3 years – the journey has left me emotionally and physically drained, and I find myself reacting in many of the same ways you mention. But my husband is so patient with me….like your husband, he deliberately tells me that he love me every single day. Even when my hormones are raging and I act (or more often react) inappropriately, he’s right there beside me. He constantly reminds me that God has a perfect plan for us. Thank you for your post – it’s so very encouraging. Thank God for patient husbands! I have one and thank God for him every day. With all my quirks and flaws, anyone lacking in patience would have never been able to handle it :). Hi Debi, am sorry for your Loss. I am a married Kenyan Lady and your daily posts have been of great encouragement to my life. today’s post has really spoken to what i am going through currently. May God abundantly Bless you and continue using you to minister to us!